Gently (on a low heat) sear each side of the Beef in melted butter in a shallow frypan, for about 10-15 minutes. This will seal in the juices of the beef, and also partially cook the meat. Finely chop spring onions, water chestnuts and sun-dried tomatoes. Add a little juice from the water chestnuts and simmer slowly on the stovetop until the ingredients are well blended and able to be used as a thick paste. For the crepes, sift flour into a bowl, add a pinch of salt. Make a well in the centre of the flour and add the eggs and a quarter of the milk. Whisk vigorously from the middle incorporating the flour, add a little more milk and continue to whisk to form a smooth thick batter, whisk in the remaining milk and melted butter to form a loose smooth batter the consistency of thick cream. Set aside to rest for 15 minutes. Stir in herbs. 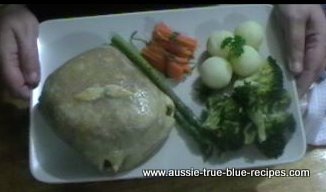 To assemble the Beef Wellington, cut the corners from one sheet of Puff Pastry, leaving a large cross shape (see video). Place a crepe in the centre, and spread with one tablespoon of the paste. Place one piece of the beef on top of the paste, and top with another tablespoon of paste and another crepe. Fold the ends of the puff pastry up, and over the centre ingredients, to totally encase the beef, crepe and paste in puff pastry (see video). Beat 2 eggs with a fork, and using a pastry brush, paint generously over the entire pastry exterior. Bake in a preheated oven at 200°C for 15-20 minutes, or until the pastry is golden.